Hand dug old wells are fascinating but can be very dangerous especially to children, animals and the odd drunk adult. They can be fatal but the same could be said about your car so the best thing to do is add safety systems just like your car. There is many ways to make your well safe yet look just how you want it. 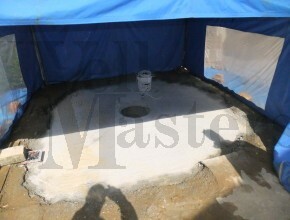 The top of your well is both the focal point of safety and also the focal point of looks and discussions. You do not need to loose out just because you want it to be safe, below is different ways to put a lid on your well top without loosing the looks. 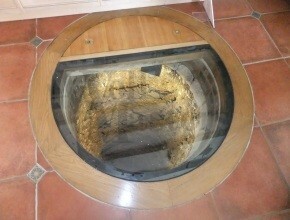 The modern alternative to the traditional well top is to have lights installed into the well and then a glass cover over the top. This is great for showing off and to be completely honest looks absolutely stunning. The glass is unlike standard glass so it will not simply crack or break. It is usually 3 layers of 10mm laminated glass which is then laminated together to create a near indestructible piece of glass just over 30mm thick. You can get thinner or thicker glass depending on what you plan to use it for. If a car or vehicle might at some point drive on it then you will need to specify that. If a person might jump on it then that is what they are designed for. If it was to be damaged one sheet will shatter but because it is laminated will still allow for the almost full weight to be applied but it will not look very nice and will indicate the need for replacement. Having said that glass covers last many many years and you can get them with anti scratch layers and also grip layers so if people were to walk on them and it was wet you would not slip on it. Condensation can be a major problem with a glass well covers so please do not leave it for anyone to install, please contact us because we have many years experience and can ensure your glass is condensation free forever. Once it is all installed it is usually impossible to put right so please contact us before contracting out to just a builder or trying to install yourself because it will be a very expensive mistake and will look very ugly. We are being contacted at least 10 times a year to advise and help with wrongly fitted glass. Metal grills have got to be one of the best ways to present your well without using glass. You can have lights down your well with a metal grill over the top. Metal grills will, like glass support a large weight especially vehicles. They are extremely safe but do not let your children play with your car keys near them. We have had calls to descend hand dug wells to retrieve many car keys and mobile phones so if you have lost keys, phones and other things then please contact us, we would rather do it with our safety equipment then you trying on a ladder. We have a specialist wrought iron worker who like us is a family run business and can make metal grills, covers and caps to any design you would want and to any colour finishing. Just some of the designs include a floral petal or concentric rings. Even lids with hinges to allow access. 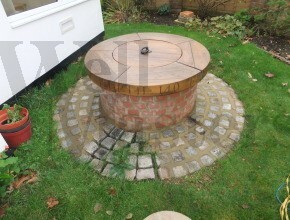 It may come as a shock to some but the brick circle top with a thatched roof over the top is not traditional. Yes they used to have something very similar which helped pull the bucket up but they were normally covered with something similar to a man hole cover we have over our drains now. 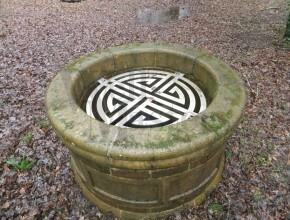 A well was not a garden feature back when they were being used, they were like our mains water taps are now. Just a source of water. They were looked after much more then how we look after our mains water pipes but that is because they were expensive and they did not have a backup water supply. Well covers come in all shapes and sizes. The most common is a round circle brick built top hole with a thatched roof, handle crank wheel with a rope and bucket attached. 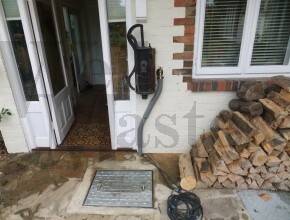 You can have this over the top with a metal grid at ground level built into the bricks for safety. The grid can have a hatch or bolted middle to allow access for a person or a bucket while still giving safety to others. Please contact us for more information and with your requirements. For more ideas please check out our gallery pages.